This particular section of my website is very dear to my heart. As a mom, I know firsthand that mom’s are inundated with information – with helpful hints on how to be a better parent, with recipes that will nourish our children, with research that indicates which books to buy, which mattresses to use and which discipline is the most effective. As a mom, I know the bottom line is that parents crave first and foremost what is best for their child. That the child’s growing and learning experience should be happy and seamless. That they should healthfully grow into strong, capable adults and be the best they can be. As the author of a cookbook and of a gluten-free website, I also know that excitement around meals and meal preparation is key to maintaining good health. My goal is to provide healthy, delicious, accessible and child friendly recipes that families can prepare together. 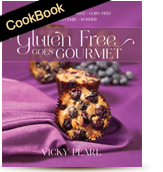 Along with those recipes, I also hope to provide all sorts of nutritional back stories to explain the choice of certain ingredients and why it may be beneficial to those suffering from issues with gluten or opting to live more healthfully. As a wellness consultant, however, I know that, although all children are special, those with behavioral, learning or health challenges require unique insights. Insights into what foods will trigger allergies or those that may help alleviate medical symptoms. Insights into those ingredients children should avoid and those that can actually strengthen motor capabilities. The posts that you will find under this tab will provide you not only with amazing wholesome recipes but with added information on how to take advantage of food groups and activities that can accompany meal preparation. This entry was posted in Children Connection, Vicky's Blog on Dec 31, 2013 by Vicky Pearl. This entry was posted in Children Connection, Vicky's Blog on Nov 6, 2013 by Vicky Pearl. This entry was posted in Children Connection, Vicky's Blog on Oct 8, 2013 by Vicky Pearl. This entry was posted in Children Connection, Vicky's Blog on Sep 4, 2013 by Vicky Pearl.